Message Boards - Boba Fett Fan Club → Fans → Do you believe in God or evolution? Re: Do you believe in God or evolution? Theory is part of science. Creationism is only a theory aswell. You keep giving reasons as to why evolution is not true. How about a reason as to why creationism is? Why does everyone think I'm trying to prove creationism?!! As I've said like fifty times already, THEY ARE !BOTH! THEORIES!!! As for the hight thing, how do you explain people who are getting shorter from generation to generation. Asian people aren't tall. And you said that tall people are no better than short, yeah, but according to that, then I'm no better than a monkey! Dinos to birds...I thought that one died about five years ago oh well. Dinos are reptile. Birds are not reptiles. Bird have wings, dinos do not. Scales to feathers? Scientificly impossible! They're spines are completly different. And the average dino was the size of a sheep. Dino-"I was two-foot-three, and now I'm just three." Quite a size change for just a few million years! They're diets different too! Don't tell me they're organs changed! And if it took all that time, it stands to reason that quite a few would have died during the change! So give me ONE transitional fossil, and well talk. Archeaopterix? It's a "Fully feathered, flying bird.". That was it's final analasis. I did not have scales, and as for the claws, um, maybe you should look at eagles, and other birds of prey. And the teeth? there are birds TODAY that have teeth! Yes, they are somewhat rare, but they are there. Spelled Ogopogo! Resides in the Okanagan Lake about 3 hours drive from where I live. Still pointless in my opinion to post on these kind of threads debating one way or another. Dinosaurs aren't officially classified reptitles you know.... Dinosaurs are their very own special catagory; Dinosaurs. And a quite a few Dinosaurs DID have feathers. It's an unknown number because only one part of the world allowed for the right kind of fossilization to allow an imprint of the fuzzy feathers around the Dinosaurs, so its possible that many a species had feathers. After all, Dinosaurs and birds shared a common ancestor. It just took a little longer for birds to appear. Thanks man you're cool. Send me a picture of him on his birthday! I've never heard of dinosaurs having feathers! I don't believe it. after five years I've never heard that. give me a link please? Let pretend that they did have 'em. Read some of the other reasons. a lot of you talk like you research and study evolution or religion all the time. those of you who just know what your pastor or parents tell you, or only learn about evolution 1 day in science class, stop posting. and im sure a few of us debaters are only children, so don't act like you have years of experience on these matters. do your research,read your bible, then come back and post. Hey Fox! Remeber me? You're awesome! Yo regimas, yeah, I'm only a kid, but when I was nine, I got an adult book discussing evolution/creation, and it made so much more sense than everything else I'd been told. After long talks, my parents began to understand too. Now I'm fourteen, and I've learned a lot these last five years, I even taught a class with four people once(two their attention spans were very short...)! And I've never been to a school, so no science class for me. Dinos with feathers is a pretty well known fact. All you have to do is look it up. Why should we pretend they didn't have them? Here's something a little more modern. 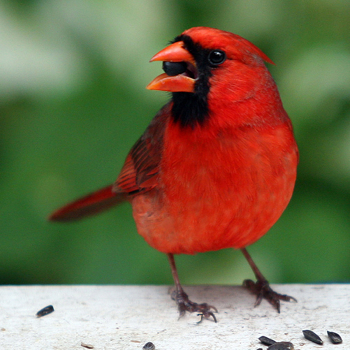 I like cardinals! Thanks for the picture, I could never find a good pic of one! But what about the scales? They're sure they had those. You can't have both feathers and scales! Its not a sure thing that they really were covered in scales. It is very hard to determine what the skin was like when there really is only fossilized bone left. We're lucky that the feather imprints have remained in Mongolia. Anyways, thats my example of evolution right there, with species having feathers and others that did not. There are also theorys that some baby Dinosaurs were covered in down to help keep them warm when it was cold and vice versa. When they got older and could tolerate hot days and cold nights better, the down would be shed. Unless it was a feathered species. How can you say they didn't have scales? It's like, duh. They've found 'em frozen. And they couldn't have died out MILLIONS of years ago, because they found red blood cells in a BONE! And everyone knows that red blood cells don't last that long! It could have if it was frozen in a quick period of time. But I only recall this ever happening to a woolly mammoth, never a dinosaur. Seco, read the post 2 above the one I'm quoting. I've never heard of these viable red blood cells. I recall that a few years ago these scientists ground up a bone and found still somewhat organic muscle tissue. at least, the processed fossil didn't behave like rock OR bone. And there has definitly never been a frozen Dinosaur. Ever. They've found them in mummified states, but thats extremely rare. It's going to be biased in either creation-view or evolution-view. So use the other link for creation-view, or this one for evolution-view. But either way, Red blood cells just don't last that long.